I am often asked how to pick fresh produce of all sorts, but fish seems to elicit the most number of inquiries. And frankly, until a few years ago, I wasn’t such a huge shopper of seafood at the wet markets, so my ability to choose fresh fish is something I have only acquired in the past 5-7 years. Obviously, practice makes perfect, so the first piece of advice I can give you is that if you buy enough fish, often enough, you can figure out the cues for yourself. But it helps to have some expert guidance. And mine came in the form of a crew member who grew up in Northern Palawan and seems to know a LOT about fish. Over the years, at various markets around the country, I have received many selection tips that I have added to conventional wisdom, personal experience, etc. Here are some of the things that may help you pick out the freshest fish and seafood around. My first tip is a bit of a big duhh tip: buy fish ALIVE whenever you possibly can. I would happily pay a 20-30% premium for live fish in Manila, and perhaps a 10-15% premium at provincial markets where the difference between live and recently deceased is often just one of a few hours. Go to the source on small islands, the small bancas fishing with lines and who have the freshest catch around. Pay them market prices and they will happily give you the best of their catch. Don’t think cheap, think fresh. They say the eyes are the windows to one’s soul. In this case, the eyes are the windows to Marketman’s fish freshmometer. 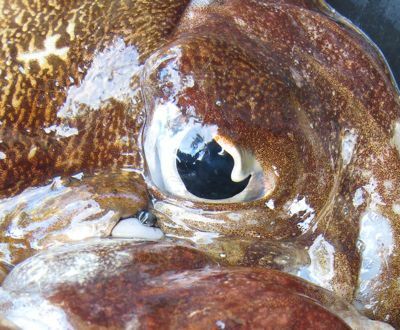 The first thing you need to check when buying fish are the clarity of the eyes. They should look alive and be totally clear. The eye of the kubotan or cuttlefish up top is a superb example of something incredibly fresh and just out of the sea. It was so fresh, it was actually still ALIVE! If only I had a video, I could have captured the creature still trying to change the colors on its skin to try and camouflage itself… it was fascinating. I did feel a tinge of guilt taking a picture of it, and knowing it would be eaten that day, but this is nevertheless the best example I have of freshness as seen through the eyes. 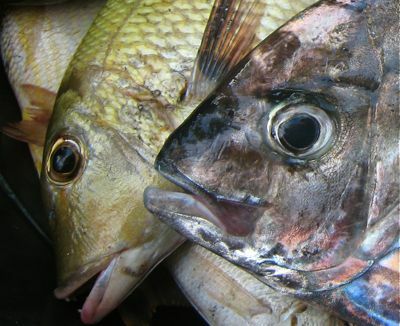 All the other fish photos here show you the clarity of the eyes, and this is a great way to start your fish selection. Blood shot eyes are NOT a good sign, neither are cataract like afflicted eyes, avoid both of these conditions. 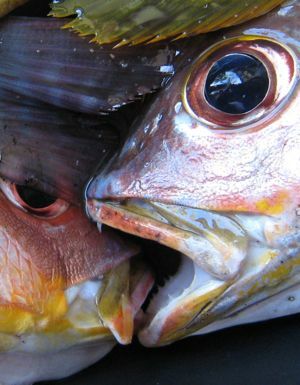 Once the eyes have passed the glassy eye test, check that the fishes gills are a lively dark or deep red. Just lift the gill flaps and see for yourself. Pale gills means the fish has been dead a while. Next, does the fish possess a sheen, often referred to locally as “laway” or saliva!? If the fish is still coated by this slighly sticky watery mucous-like film, it is fresh out of the sea, and better yet, hasn’t been sitting on ice for any length of time. You may also need to gently poke the flesh of the fish, it should be pliable and bounce back a little, providing some resistance and spring. It should feel like your skin on your lower arm in your twenties unless you were seriously overweight. You do NOT want it to feel like the flab on your upper arm that tends to happen to most 60+ year olds…. (heehee, sorry, no offense meant to various readers of varying ages!). If the flesh feels mushy that is a bad sign. Thanks for the fish buying tips. I also know that a very telling sign of the seafoods’ freshness is in the smell. Seafood should smell of the sea and not fishy. As soon as it begins to smell “malangsa” (to Ilongos that is), it is not fresh catch. Also not fresh seafood begin to release allergens which give undesirable reactions to people who are prone to seafood allergies. Alive is best but difficult to come by for many of us city folk. I think there is nothing better than fresh catch. These are the perks of living in the provinces. I remember weekend fishing trips with my father to catch “bulgan”, apahap to Manila folk. Charcoal grilled straight from the water. That was such a great treat!!!! regarding your big ‘duhh’ tip, i once had an interesting conversation with a singaporean chef who is against the grain with this whole ‘live fish’ thing and that the only selling point of this is just theatrics. he claims a fish just freshly caught off its natural habitat has the best flavor –of course after it dies, that is, and that flavor is locked in by icing it down. and by keeping the fishies alive inside a dark styro ice chest, transporting them through long drives and rough terrain, and transferring them to an aquarium with pink lights people oggling them and morse coding away on the glass, is the most stressed-out fish ever available. and their meat is definitely affected. i see the point in my friend’s argument, but can all these chinese restaurants actually be wrong about live fish? I once had a wonderful experience observing the fish market in Bongao, Tawi Tawi. Gorgeous catch of the day glistening left and right. I even saw a squid with specks of black ink “glittering” up and down its body. parang magic! thanks for sharing all these very helpful tips! Pardon my ignorance MM, but what are those small fish in the last photo, and what is that big fish next to them? Thanks for the tips. I do however have a problem, we can’t seem to get fresh fish in our area of the US. They’re always on ice, and certainly dead. The eyes are certainly never ever glassy. Almost all the time, at the regular supermarkets, the fish are fileted and sliced up already. Do you have any tips for buying fish that is already processed? While they do sell some live fish in the asian markets, I can’t seem to get over how dirty the fish tanks are. I know that the sea is not clean, but I guess seeing it upclose, just grosses me out. Anyway, can I just simply ignore the dirt. I guess it should be noted as well that freshness does not guarantee quality. A fish that died at its prime and stored properly would be of better quality than a live fish that has been languishing in a polluted tank for days. Stress is also very important for fish, not just cows and pigs. 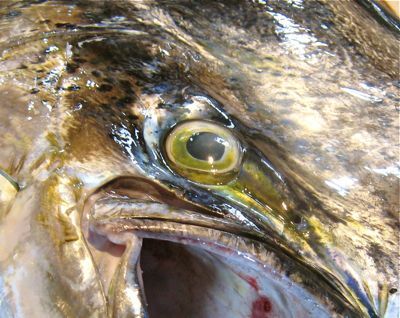 Tuna destined for the sashimi trade, for example, are stunned immediately by inserting a pin at the back of the head to prevent stressing it out. A stressed out tuna yields mushy flesh, and if it is allowed to twist and flip uncontrollably, it will have hematomas all over its body, driving quality downwards. So there is reason behind Jules’ friend’s beliefs. But what I think MM means by buying live fish is buying from a market just beside the sea where the fish are alive because of proximity, not from a market hundreds of miles from the source where fish arrive under induced coma or paralysis just for the sake of being able to say “hey, they are alive aren’t they?! ?” Alive? Yes. But healthy? No. Aha an eternal verity from my putrefying Latin yet, piscis bene olet dum nihil olet. Fish smell well when they donâ€™t smell of anything. I honestly cannot bear to cook fish that was alive a few seconds before hitting the pan, except for hito – which I do not really like anyway. The way crabs and shrimp struggle against the heat of a pot turns me to jelly. Paano pa kung isda? Kaluoy kaayo! Chris, well said. And yes I pretty much mean buying fish live at the source. Though I would still opt for a live fish in the as opposed to a dead and poorly transported one. Now as for fresh fish caught then killed and flash frozen and properly transported, now that might be better than a lot of our other fish which is poorly handled. Hmm, I wonder why lobsters and crabs don’t get the stressed out effect, or do they? I have to buy those alive whenever possible. This post and all the comments have taught me so much. I really never understood why people said look at the eyes, an now I do! I have always let my helpers choose the fish because I have lacked confidence in doing so, I will take my newfound knowledge with me to the market this weekend. Thanks guys! Oh, I’d have to add that like you, I’d prefer a live, stressed out fish over a dead one that has not been stored properly. Crabs and lobsters do succumb to stress after a while. Their muscles (i.e. 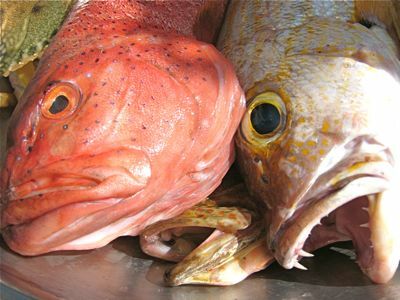 edible flesh) tend to atrophy after being kept alive out of the water, without food. So the quality does go down, but it goes down slower than if it died and not flash frozen very soon after death. The flesh starts to decompose quickly after that. If you get crustacean with mushy flesh, that’s a very bad sign. MM, your story about the cuttlefish reminded me of the time my friends and I were in Bolinao. I was assigned the task of cleaning two big specimens that our friend Edward had haggled for and bought from a fisherman right at the beach. Ordinarily I would just do my thing and get done in no time at all. However, I made the mistake of looking at the spots in the elongated bodies that, curiously, seemed to ‘blink’ alternately (for want of a better phrase). Edward told me that THAT is a sign of freshness, that the critters were recently hauled up from the sea, and that they were still alive. *Gulp!! * I felt so guilty, especially when I happened to also look into their (pleading but unblinking) eyes. I almost failed to do my assignment. However, with a whispered apology to the two critters and thanks for helping to sustain us, I quickly ripped out the heads, removed the plastic-like thingies at their backs, took out the innards, and rinsed both in the foaming sea. (Oh and did I mention that my friends threatened to put ME on the spit over the fire if I didn’t clean the cuttlefish? hah!) I marveled at how my entire fist fit inside the body cavity; the critters were really big. Yummy grilled cuttlefish for lunch! My qualms and my guilt rose to the air together with the smoke from the cooking fire right there on the beach. maybe if they maintained the aquariums to be similar to the ocean’s saltwater conditions and kept the live fish to rest for at least 7 days or so, away from pesky 4 to 8yo homo sapiens, then the fish would be stress-free and right for the cooking. higher cost but better flavor. and as chris says, same goes for crabs. when you crack a cooked crabclaw and you find a thin shriveled semblance of crabmeat hanging inside, then that’s a crab that’s been out of water way too long. but crack one that has meat immediately bursting out from right under the shell (and you even curse when the shell shreds embed into the chunky crabmeat), then that’s a freshie!!! so buy and cook on the same day. but if not, then buy and steam immediately, then store in freezer. I used to shop with my mom at the market when I was a kid, and learned from her how to look for fresh fish. The eyes, the smell, and the gills, plus a quick poke on the skin. All the comments and the main post brought back memories of walking around the markets with her. MM, I understand it would be very difficult to catch reef fish live for food and transport them unless they are caught with cyanide. 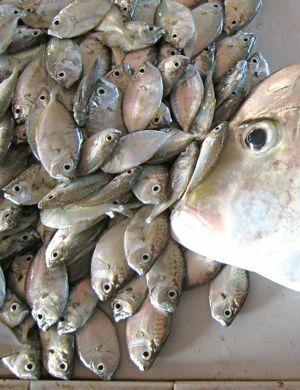 That is why many fishermen against cyanide fishing would like there to be a ban on the transport of live food fish such a lapu-lapu to prevent the use of cyanide on the reefs. Worth investigating, as the other methods of catching reef fish live are so difficult to do. I want to buy bulk frozen fish in Manila. The kind that is used for smoked fish. I think it is bonito or makeral. Can somebody advice me of a good place.